On April 1, 2019, the New York Legislature passed the 2019-2020 budget, amending the New York Election Law. Effective immediately, all employers must provide registered voters with up to three hours’ time off at the beginning or end of working hours to vote. Registered voters must request time off to vote at least two working days before the election. Previously, if a registered voter did not have sufficient time outside of his or her working hours to vote in any election, he or she was allowed to take up to two hours without loss of pay at the beginning or end of working hours to vote. The previous law also provided that if an employee had four consecutive hours either between the opening of the polls and the start of his or her shift, or between the end of his or her shift and the closing of the polls, the employee would be considered to have had sufficient time to vote and was not entitled to paid time off to vote. Under the new law, the four-hour consecutive window is eliminated. Employees are guaranteed requested time off for voting. Employers are encouraged to update their voting leave policies to reflect the new amendments to the New York Election Law. Employers are still required to post a notice of the provisions of Election Law §3-110 in conspicuous locations in the workplace for at least ten working days before every election. The notice must be kept posted until the close of the polls on Election Day. 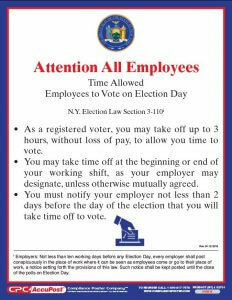 CPC is in the process of updating the New York Time Off to Vote poster with the new amendments to the New York Election Law. To pre-order a copy of this poster, click here.